Today I travelled back to London and the hospitality of Karen and Kieren. We attempted to watch Dumb and Dumber 2 but failed to see it through to the end because it was truly that bad. The Thai takeaway food though was great and so was the company! I love the Facebook. Through the FB, my cousin that I hadn’t seen for years found out that I was in London, contacted me and today we had a really wonderful time catching up and looking at art at the Wallace Collection. 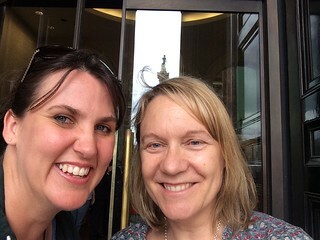 Today I did my final shop (toothpaste, underarm deodorant and self-raising flour plus a couple of impulse buys I couldn’t resist) and met Heather for lunch at the Bear and Staff in Leicester Square. 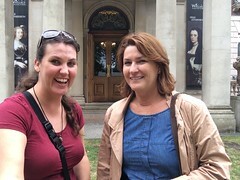 I then dragged her along to the National Gallery for a free tour. There was a big crowd for the tour so I told Heather we may need to use our elbows because it was important to stay at the front of the group. A crotchety old lady carrying her own chair, complained to the guide about me but he seemed to realise I was just joking. 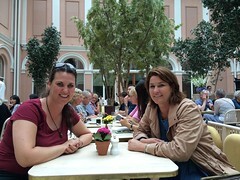 Heather and I soaking up the culture! After the tour, I sped down to New Eltham for my final go on Disney Infinity. That is a really fun game and I like playing it with vastly younger than me people! I had my final dinner and a movie with Kim and Vicky before getting back to London Bridge for my last night’s sleep in the UK.